Skywatchers are in for a treat in late April: An annual meteor shower will peak when the moon's absence leaves the night sky dark and great for viewing. 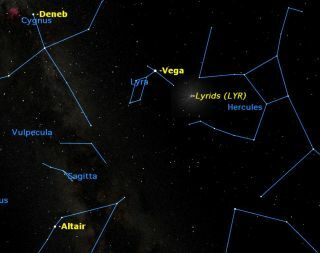 The Lyrid meteor shower peaks overnight from April 21 to April 22, with the best observing coming between midnight and dawn on the 22nd local time, experts say. The moon will be new at this time, so the Lyrids' bright flashes won't be drowned out by the glare of Earth's nearest neighbor. Meteor showers are generated when Earth plows through streams of debris shed by periodic comets on their path around the sun. The chunks of debris die a fiery death in our planet's atmosphere, leaving bright streaks in the sky to commemorate their passing.